A couple of months ago, we said that Netflix created “the simplest internet speed test ever” when it launched fast.com. But Ookla – makers of the original speedtest.net – may have just outdone it. 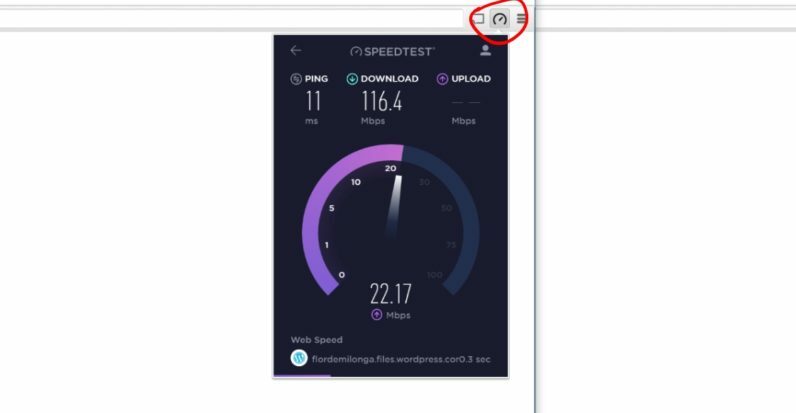 The company just released a speed test Chrome extension that lives next to the OmniBar. Just tap on it, click go, and you’ll get your download and upload speeds, as well as a ping value. You might ask: “why not just go to speedtest.net?” I mean sure, you could do that, but this is about the convenience of it all. Think of all the times a webpage seems to be running slowly, and you wonder whether it’s their servers or you. Instead of being consumed by uncertainty, this lets you quickly check to confirm whether you should go restart your router or not, all without leaving your current tab. It also includes the load time for whatever website is open in the active tab, which is a neat touch for measuring the efficiency of pages. Another neat touch: if you close the extension window while the test is ongoing, it will show your speed in a little bade next to the to the speed test button, so that it’s not obstructing your view. You also have the option to share it on social media if you’re into bragging about your internet speed. You can also log into your speedtest.net account to save your results and view your history. You can download it over from the Chrome Web Store now at the source link below.